New York: Harper & Row, 1988. 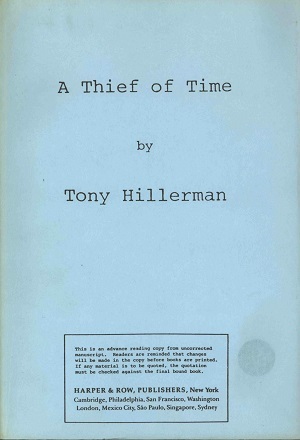 This is the advance reading copy of A Thief of Time. The eighth book in Tony Hillerman's Navajo Mystery Series featuring both Joe Leaphorn and Jim Chee.
" This is am advanced reading copy from uncorrected manuscript. Reviewers are reminded that changes may be made in this proof copy before books are printed. If any material from the book is quoted in a review, the quotation should be checked against the final bound book." This edition gives insight into a usually unseen process of promoting a book before publication. An advanced reading copy is the uncorrected proof that is distributed, without charge, to: journalists, book sellers, and celebrities for review and for promotional purposes. This is usually done a half a year in advance of the book release, both so any issues can be corrected and so any celebrity endorsements can be printed on the dust cover. Format: Paperback, 22.7 x 15.6 cm. Binding: Light blue paper covers printed in black and the title, author, and publisher are printed in black vertically on the spine.